Time to eat? Eight restaurants and a 24/7 Food Court offer delicious choice at the Monte Carlo. At the top of the culinary tree is Andre’s Restaurant, a gourmet French experience that is the most honoured and awarded restaurant in Las Vegas. Star chef Andre Rochat also offers three private dining rooms, plus an intimate Cigar/Cognac lounge. Choose your favourite classical French dishes, together with a great bottle of wine from over 15,000 vintages. The Brand Steakhouse is on the Casino floor and is the place for carnivores. How about seeing if you (and five others, thankfully) can polish off the 120oz Ultimate steak? At Diablo’s Cantina, it’s all about wicked fun. Part Mexican restaurant, part nightclub, this can be a wild night out. The frozen Margarita bar and giant ‘wheel of sin’, open-air dining are all part of two floors of entertainment. 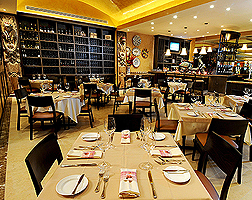 D. Vino does Italian food and wine in a casual, yet sophisticated setting. Seasonal ingredients, fresh lobster pasta prepared at your table, wood-fired pizzas and the chance to get involved with the cooking make it special. D.Vino’s unique Enomatic wine sampler is a clever way to try some very rare wines by the glass. In The Pub, it’s all about the beer – 300 of them. Plus, there are 35 TV screens of big sport, as well as burgers, grilled fish and the infamous 8lb ‘big feast in half an hour’ challenge. Chinese food and sushi are on the menu at the Dragon Noodle, as well as delicious, hand-crafted “tiki” cocktails. For big appetites, The Big Belly Buffet is just the right size of made-to-order dining from all corners of the world. Have a quick bite or sit down for a huge meal. A salad bar, fresh pasta, grill specials and hearty carvery are on hand from 7am to 10pm. The Café is your destination for refined American fare in a casual setting. The Food Court is convenience personified, a 24/7 service featuring well-known names such as Starbuck’s, MacDonald’s, Subway and many more.